The 9 Best Wineries in California! California’s Northern-most regions are well known as wine country, but you can actually find grapes growing throughout the Golden State. 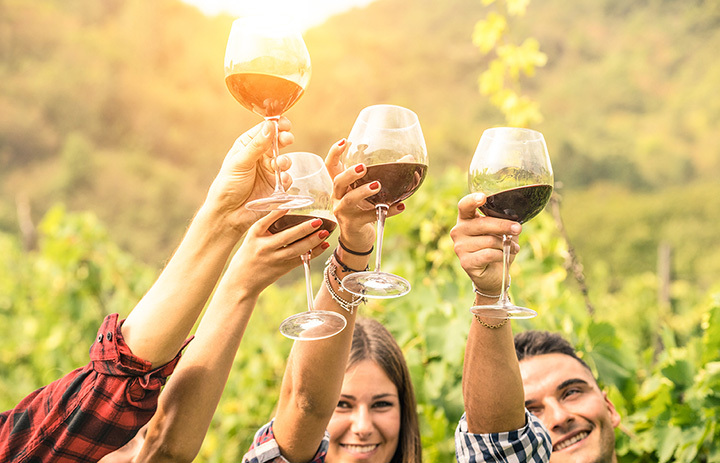 Even as Central California has begun to gain notoriety for its wineries, there are also some delicious wines being made in the warmer climates of Southern California. Check out just a mere 9 of the best wineries in California. Ledson Winery is known around the world for its “castle,” making it one of the most recognizable wineries in California and a standout in Sonoma. After all, castles aren’t something that you see very often, especially so far from Europe. Ledson offers a full wine tasting experience with limited bottles, numerous tasting bars, picnic areas and more. Opus One is an ultra-premium winery, with a rich and elite history to back up the higher tasting room fees, available by appointment only. For oenophiles, the chance to experience one of the world’s best wineries with a world-renowned heritage and a modern facility is well worth the extra cash. Sterling Vineyards offers some of the best views of Napa Valley because it is perched on a hill, accessible only by aerial tram. There’s much more to experience at Sterling than just wine, thanks to the attention to detail that offers both an historical and a modern look at winemaking. Try a food and wine pairing and spend an afternoon exploring the winery’s balconies and walkways for scenic views. Malibu Wines is open every day of the week to give visitors a taste of wine and a glimpse at where food comes from in Malibu Canyon. The expansive property offers special dinners and various spots to hold your own picnic, as well as an organic garden. Reservations are recommended and you can also host your own special event or family dinner. Or just spend some time tasting wines before hitting the sand. Tablas Creek in Central California features an organic estate vineyard and is the product of two families going into the wine business. The winery specializes in Rhone style wines and offers a selection of outdoor and indoor tables for daily tastings. You can also opt to a reserve a seat at a table or enjoy a tour of the facility. Alpha Omega pays tribute to the rich farmland of the Napa Valley, blending old world traditions with modern tastes. In keeping with their emphasis on hospitality, the vineyard offers an array of tasting options at varying price points so that every wine lover can have an experience that fits their own personal tasting style. As one of the oldest vineyards in the Napa Valley, even weathering the storm of Prohibition, BV has garnered quite a following from fans all over the world. If you’re in the area, BV is one of the best vineyards to explore, as it offers tastings and special events. Call to see if a tour is open as the historic property is sometimes under renovation. Beringer is over 140 years and still one of the most important wineries in Napa Valley. The original family is still very much a part of the winemaking process and the property is open for tastings, tours, special events and general explorations of the gardens, historic tunnels and beautiful architecture surrounded by grapes grown with sustainable practices. CADE is a relative newcomer to the Napa Valley, founded in 2005. As an innovator in winemaking, CADE has a LEED-certified tasting room construction and buildings and uses modern winemaking practices that are moving toward organic farming. As CADE continues to develop, it is a great way to see winemaking moving into the modern world, surrounded by the deep history of California’s older winemakers. View more California Wineries & Vineyards.